You may be wondering which number belong to a specific Nigerian Network. 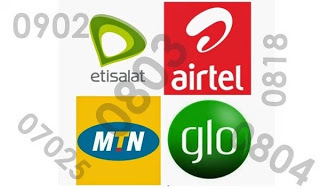 Most people prefer calling their family, friends or loved using the same network because they know they would be charged at cheap call rates, but the problem arise identify which Number is either MTN, Airtel, Etisalat, Glo or even NTel. In this article, I will explain how to identify number prefix for each Nigerian Networks. Here are some popular prefix numbers that we have in Nigeria today,which is MTN 0803 followed by ETISALAT 0809 but we also got some unfamiliar ones like AIRTEL 0701, NTEL 0804, GLO 0815, VISAFONE 07025 and so much more. Now you can safely identify each Nigerian Network phone number. Note: The Prefix Number list would be updated regularly. If I omitted any prefix Network Number you know, notify using the comment box.